Khloe Kardashian flees to Houston and new boyfriend James Harden after ambush by ex-husband Lamar Odom. What makes any uncomfortable situation better? Food. On the heels of a surprise run-in with ex-husband Lamar Odom, E! News learns that Khloé Kardashian jetted off to Houston to meet up with her NBA beau James Harden. 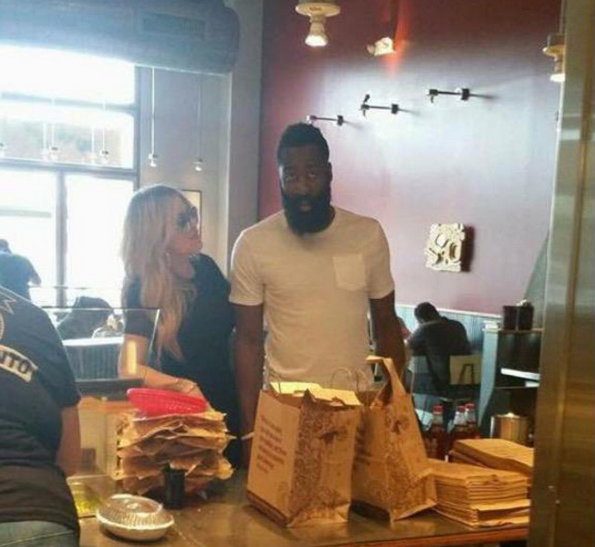 The pair were spotted stopping at a local Chipotle for some lunch earlier today by multiple fans on Twitter (they were kinda hard to miss with Harden's white Rolls Royce and all). Oh, and no word on whether these two opted to spend some extra moolah on guac, but we're willing to bet they were OK with it. While it may seem as though the E! star flew out to Texas to get away from the recent drama, the trip was actually planned way before Lamar's recent antics, according to reports. Khloé is said to be in H-town to celebrate the Houston Rockets player's birthday this weekend (Harden's actual birthday is Aug. 26). James Harden just signed a $200 million dollar deal with Adidas. Best believe KKK Khloe will get all of that money. Another black man falls for the satanic spell of a racist succubus. The KKK sluts truly are satanic witches! Black men just won't learn until their screwed up like Odom.